The plants yielding the black and white pepper of the market are climbing or trailing shrubs. The stem attains a length of from fifteen to twenty-five feet. The climbing portions cling to the support (usually large trees) by means of aerial roots similar to the ivy. The young fruit is grassgreen, then changes to red, and finally to yellowish when ripe. In southern India the flowers mature in May and June and the seeds ripen five or six months later. 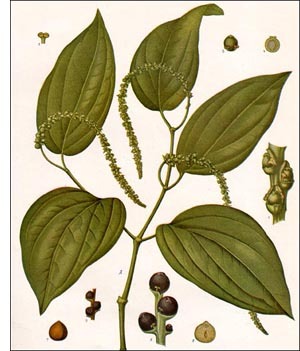 Pepper is a native of southern India, growing abundantly along the Malabar coast. It thrives best in rich soil, in the shade of trees to which it clings. It also grows in Ceylon, Singapore, Penang, Borneo, Luzon, Java, Sumatra, and the Philippines. It is cultivated in all of the countries named, especially in southwestern India. Attempts at its cultivation have been made in the West Indies. In India the natives simplify the cultivation of pepper by tying the wild-growing vines, to a height of six feet, to neighboring trees and clearing away the underwood, leaving just enough trees to provide shade. The roots are covered with heaps of leaves and the shoots are trimmed or clipped twice a year. They begin to yield about the fourth or fifth year and continue to yield for eight or nine years. The chief use of pepper is that of a spice, added principally to meats, but also to other food substances. Applied externally, it is used as a counter-irritant in skin diseases. Italian physicians recommend it highly in malarial diseases.